After the passage of fifteen centuries, does the Sinai brotherhood still feel the presence of Saint John Klimakos, author of the renowned Ladder of Divine Ascent? “As though he were here yesterday!” says Saint Catherine’s Geronta Pavlos, adding that the saint’s words continue to guide the Monastery in modern times as of old. Hundreds attended John’s enthronement as abbot – not least, Prophet Moses, who appeared once more tending God’s people in Sinai, directing servers in the Monastery refectory. 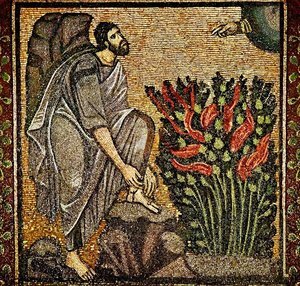 And amidst the Arab conquests which roiled the region, pilgrims continued to arrive in large numbers to remove their shoes before kneeling on the holy ground where Moses met God at the Burning Bush. It was very early in the Byzantine age that its great theologians understood the Bush as a “type” of the Mother of God. Like the Bush which contained the non-consuming fire of the Pre-incarnate Logos, the Holy Virgin held the fire of divinity in her womb without being consumed by it. Thus it was in honor of the Annunciation to the Theotokos that Sinai monks dedicated their first altar in the fourth century, on the roots of the Burning Bush, to the Most Holy Mother of God. 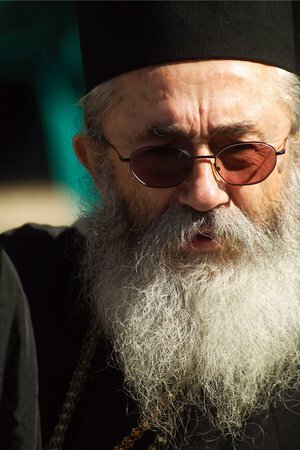 Priestmonk Arsenios, successor to long-time Monastery “Dikaios” Geronta Pavlos as the spiritual father in charge of the Monastery’s spiritual life, notes that Saint Catherine’s long history of unbroken peace doesn’t mean that the Monastery was never under threat. Until today, many are the challenges it has faced through times of great upheaval, whose repercussions continue to be felt throughout the wider region. What then gives the words of Saint John their immunity to the passage of fifteen centuries? What inspires pilgrims to point their footsteps once more to the Holy Mountain in spite of a frustratingly slow resolution to the problems of the surrounding regions? What sustains a small brotherhood in its struggle to meet the economic needs of a Monastery whose legacy of peace plays on the world stage before a global audience, yet has no steady means of support? Saint John Klimakos, whose memory is celebrated by the entire Orthodox Church on the Fourth Sunday of the Great Fast, lived in the remote wilderness of Sinai - but his words have been the inspiration and help of Christians in every land since his time. It is a reminder that Sinai is so small, and isolated, and yet the spiritual heritage preserved there is significant for the whole world. Perhaps for this reason, John’s disciple, Saint Anastasios, writes at length of the trinitarian nature of the divine image in man which mirrors the trinity of Father, Son and Holy Spirit, and the two natures of Christ. 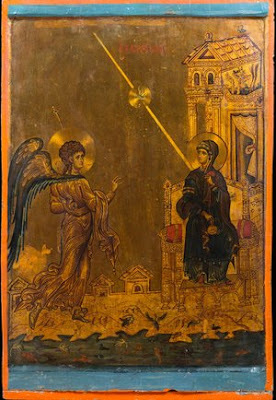 In order to understand the two births of the Logos of God for instance, we need only consider the double birth of our own logos, wrote Anastasios: "A single thought is begotten bodilessly in the heart in an unfathomable way; then bodily as a word by the mouth to become known to all – without separation from the soul of which it was begotten." Similarly, the Logos and Son of God is born invisibly and unfathomably of the Father before all ages; then of the Holy Virgin in the flesh to become known to all the world – without separation from the hidden essence of the Father of whom He is begotten. Self-knowledge leads to knowledge of God, Anastasios says, because the soul typifies the full theology of the Holy Trinity. He supports this by isolating the characteristics of the Trinity in the unity of man’s unbegotten soul, its begotten logos, and its proceeding nous (which Saint Paul called the “spirit”; described as that faculty of the soul where man comes into contact with God). “Man is created to know God,” say the patristic Saints – not from an intellectual distance but through personal experience of His divine energies. 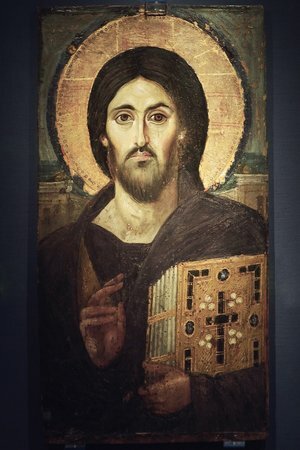 If it is through the incarnation of the Word of God that the virtue and power and wisdom of the unseen Father and Holy Spirit are manifested to the world, says Anastasios, it is through the birth of our own logos as words by the mouth that the virtue and power and wisdom of our unseen soul and its nous are manifested. By extension then, as the mind of the Father is made known to the world through the incarnation of His Word, by His Holy Spirit, does it not follow that we become the vessel of divine grace to the world by uniting our own logos with the divine Logos – of whom Saint Paul says, “It is God who energizes in us to will and energize for His good pleasure”? Therefore, if Anastasios records the theology underlying Saint John’s practical guide – the theology which leads to dispassion and is produced by it – he opens a window onto the mysteries unspoken by his teacher. This begs the question of who the Ladder was really written for. Like Christian seekers of every age, John of Raithou (at whose behest the work was written) asks John of Sinai to record his divine visions; and like God-bearing fathers of every age, John responds instead with practical advice on how to achieve them – i.e., through the knowledge of God which Moses begged for when he implored God to see Him on Sinai. God allowed Moses the experience of His divine energies in the sight of His “back parts”, the knowledge of personal contact with God as interpreted by the patristic age, rather than the theoretical contemplation of His inapproachable essence sought by the religious traditions of the West. Thus John of Sinai teaches how to win freedom from the passions so that the Holy Spirit can take up residence in the purified nous – the mind of the soul that searches out the mysteries of God – and there reveal them.. If knowledge of God is won through the soul’s logos and its nous, what of the unbegotten soul itself? With its essence hidden in the mystery of the divine one in whose image it was created, Anastasios notes, we neither see our soul nor have any visible way to prove its existence; nor does anyone know its origin. This allows us to understand the distinction between the divine essence and energies of God, as a result of which man can achieve the union with God of theosis, the purpose of his existence. Is this knowledge really meant only for monks? Or, in directing his teachings to them, is John simply freeing himself to write of extremes to those prepared to undergo them? While affording those who are not, the freedom to ascend his ladder at their own pace? If John was precocious in being tonsured a monk on the Holy Summit of Sinai while still a teenager, his grounding in the theology of the Holy Trinity reveals the vision for which he was named the “new Moses” in honor of the God-seer who received the knowledge of the Trinity on Sinai. Saint Catherine’s present Abbot and Archbishop of Sinai Damianos I observes that Moses' writings in Genesis make this clear, as well as his account of the theophany on Sinai, where, foreshadowing the full revelation of the Holy Trinity at the Transfiguration of Christ, the voice of the Father is heard, the grace of the Son revealed in Uncreated radiance, and the Holy Spirit represented by a cloud. Breathed into mankind with the divine breath at the creation of Adam, the experience of God is every human being’s deepest longing, and the height of his loss at Adam’s fall from grace, when humans’ natural will for good was corrupted, having lost the instinctual knowledge of what is pleasing to God. But without knowing the divine Logos, in Whom they received their very being, “how could humans even be rational?” asked Saint Athanasios the Great. 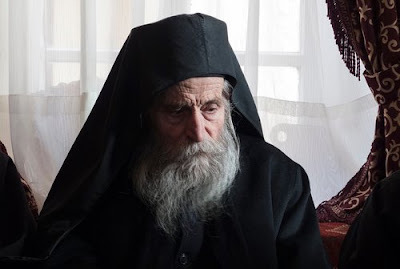 An Orthodox elder is distinguished by the ability to discern the will of God in every circumstance. 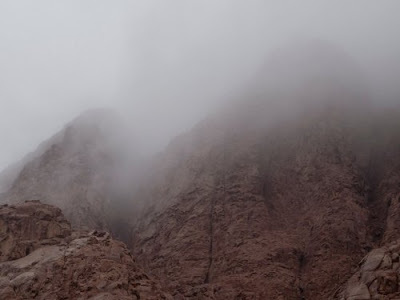 As the Book of Exodus makes clear, the roots of Sinai’s ascetic theology in the accurate knowledge of God are distinguished in the immaterial fire of the Burning Bush where God reveals His name “I Am Who I Am” to Moses. The knowledge empowers Moses to rescue God’s chosen people from slavery to the passions of Egyptian idolatry – the habitual sins that expand within the human soul until they take the place of God Himself. But Christ alone is the Way and the Truth and the Life through whom the promised land is entered in freedom from the passions; for it is only in the soul purified by the grace of His resurrection that the Holy Spirit comes to dwell. Moses leads the Israelites out from symbolic slavery to the passions – but then he shepherds their wanderings for 40 years in the desert. Maybe it is not so difficult to take one’s life back from the peril of evil, the beginning of joy in the Lord. But having chosen the life in Christ, the road less traveled remains; a difficult journey, often uphill, and sometimes through desert wastes. A healed will emanates only from a healed human nature, say the saints. To cure one’s symptoms a doctor must identify the underlying illness, and this is where Saint John’s medical handbook of healing for the soul provides the necessary science. The passions are well known: anger, fear, pride, egotism and the like; but John explains whence they come, how they nurture each other, and how they are healed. 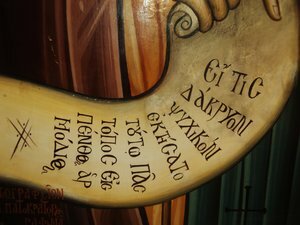 For this reason in monasteries, the Ladder is read aloud every year during Great Lent’s journey to Pascha. It sounds too simple: firm hope in future blessings. And yet it works. In Orthodox monasteries at least, depression is unheard of. Are you suffering from the flesh - who was that recently decimated by your thoughts? Overcome with fears? Kill them with fear of the Lord, says Saint John, for contrition slays cowardice. It is a difficult journey, but not a grim one. Monasteries are happy places. John is not one to hide behind the truth, yet his wit is refreshing to a fault. And he is perhaps most remembered for his term “joy-producing sorrow” – the “commingling with God” that infuses the sorrow of a soul having repented for its sins. 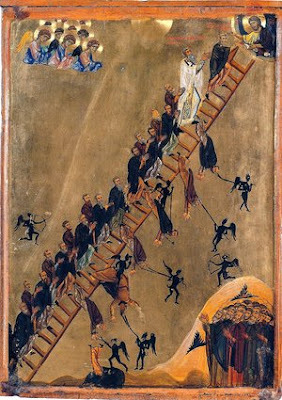 As a spiritual handbook, the Ladder thus remains in constant use today, not only in monasteries but by all those seeking deeper consciousness of the presence of God in every day life. As one of the world’s holiest sites of pilgrimage, Saint Catherine’s is more than a simple monastery. Like the monk-guardians of the Holy Sepulchre in Jerusalem, the Sinai monks are responsible for physically guarding the Monastery and its spiritual treasures: from the 3,000 year old Burning Bush to the oldest icon of Christ in the world, from the relics of the Great Martyr and Bride of Christ Saint Catherine, to the world’s greatest library of icons and ancient manuscripts. 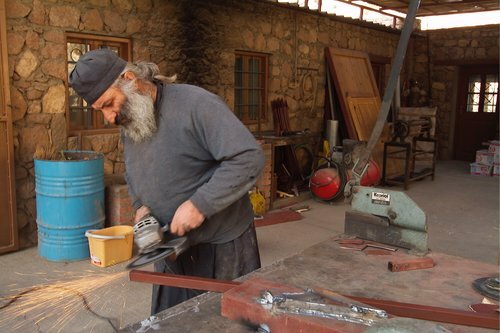 Not an arm of any ecclesiastical body, nor supported by any entity, the nonprofit Friends of Mount Sinai Monastery was created to support the hard-pressed monks who struggle to preserve this unparalleled heritage, and its hope for mankind. Such hope however consists mainly in the living tradition underlying such a heritage. 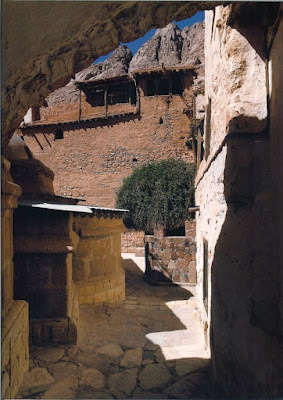 Above all, Sinai’s monks are responsible for the preservation of the path to knowledge of God at the core of a peace linking late antiquity with the 21st century. 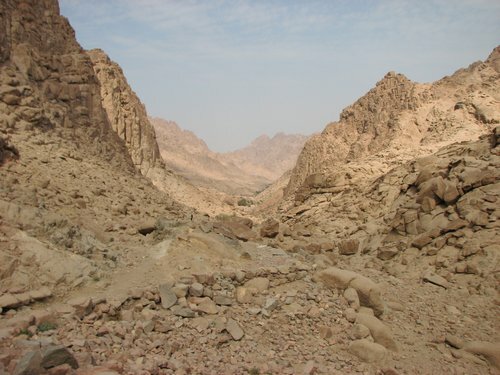 It has been said that the sixth century simply never ended in Sinai, and it is intriguing to explore the mysteries of such a timeline, not only in the Ladder where Saint John records them – before it unfolds – but in the life of the monastery whose monks live his presence as though he were abbot yesterday. 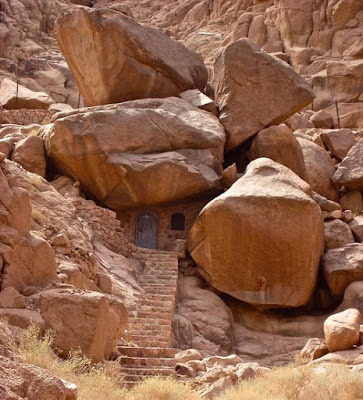 “There have been monks at Sinai from the latter third and early fourth century. Words spoken by Sinai monks are preserved in some of the earliest Sayings of the Desert Fathers. 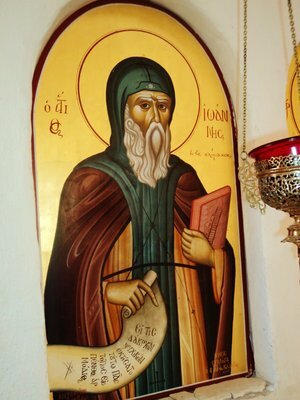 In the seventh century, Saint John Klimakos wrote the Ladder of Divine Ascent as a compendium of the earlier monastic experience and guide to the spiritual life. “Saint Hesychius and Saint Philotheos of Sinai have also left us luminous words. The writings of these three saints form a distinctly Sinaite school of ascetic theology, which had a profound influence on the development of later Orthodox spirituality, in Constantinople, and on Mount Athos. 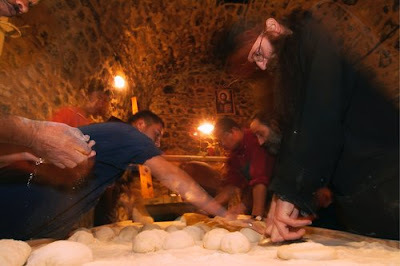 The monks at Saint Catherine’s Monastery have inherited this as a living spiritual tradition. The biggest challenge they face is to live up to this heritage. Under the guidance of His Eminence Archbishop Damianos, the Sinai fathers share this legacy in many ways, recently allowing the world’s most precious icons to travel for the first time to museum exhibitions. They participate in academic conferences, and further the study of Holy Scripture through the Sinai Palimpsests Project, in which secrets of ancient scriptural texts lost to history are being uncovered and studied for the first time http://sinaipalimpsests.org/. Considered secondary only to the Bible, the Ladder of Divine Ascent has been published in many languages, and monastery fathers traverse the globe to share the insight won by life-long application of its precepts. Even so, pilgrims from around the globe still find their way to Sinai, even in face of the wider Middle East’s ongoing conflicts. In smaller numbers, they continue to enrich the life of the Monastery not only with their outward curiosity, but with the mystical quest of every soul for communion with God. 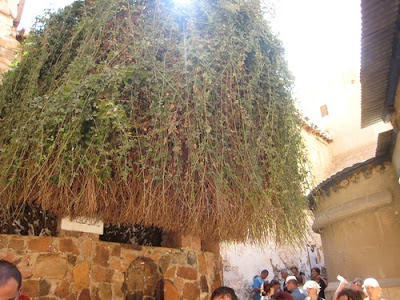 “This the authentic Bush from the time of Moses, and the only one of its type in the Sinai Peninsula. Many signs have been given by God and many people have seen miraculous events here. Many visitors identify as tourists rather than pilgrims, but the monks know that on the holy ground of Sinai there is no such thing. “In this sanctified wilderness where the voice of God may still be heard,” said Archbishop Damianos, “all who value inner peace hope to experience the stillness that exists between the soul and God.” The stillness of the knowledge of God’s will, breathed into humankind at the creation of Adam… Perhaps many do arrive as tourists, says Father Arsenios, looking forward to nothing more memorable than the sight of a few curiosities – until entering the ancient basilica where prayer has ceaselessly risen to heaven for fifteen centuries, suddenly breathless with astonishment – perhaps something likes Moses at the Burning Bush, still growing outside the Chapel of the Annunciation in the Monastery courtyard. At neglect of their own needs, Saint Catherine’s monks have devoted many resources in recent decades to the creation of extensive infrastructure for visitors’ convenience, working hands-on to make the pilgrimage experience as seamless and rewarding as possible for people from all over the world. Only in recent months have Monastery fathers finally undertaken major and long-overdue restoration of the main monastery structure. This involves the fundamental renovation of the Monastery’s south wing which could no longer be delayed due to risk from faulty wiring and mold. Further information can be obtained at the above website address, or by contacting Saint Catherine’s Monastery directly: (International code from your country) 20 693 470 349 or at sinaimonastery@gmail.com. The monks are most appreciative of all support as in the words of His Eminence, “Even small amounts go far in Egypt.” Nonetheless, the fathers consider all donations large. 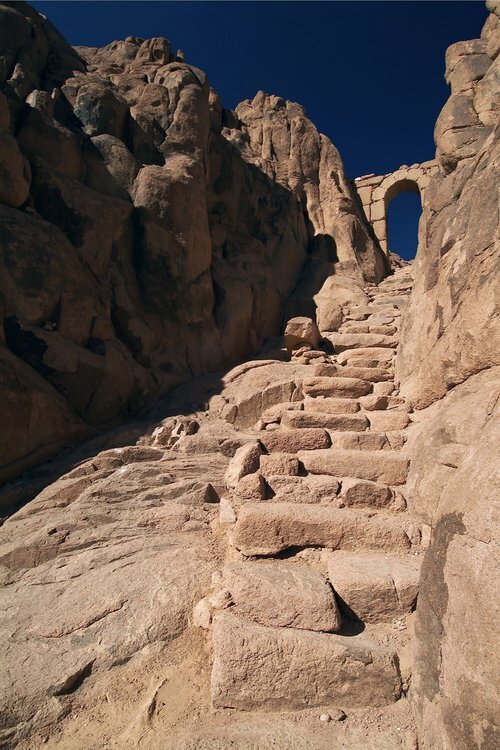 It is in the practical life after all, that Saint John sets up his ladder leading to the radiance of divine vision, which invites a closer look at what monasticism means in Sinai. “It is not safe to swim in one’s clothes, nor should a slave of passion touch theology,” he warns. The practical life has always been considered safer not just for those in society, but for monks too. Obedience itself has a different flavor in Saint Catherine’s, directly traceable to the desert tradition in which Saint John was trained – at once more strict, yet more flexible than the normative for large monasteries: Lacking supervision, desert dwellers are held to a stricter standard, their own conscience. And yet, living alone, each one can obey a different program. Saint Catherine’s manages to incorporate the desert ethic into a schedule of work and prayer that includes the entire daily cycle of ecclesiastical services. Striving to account for Saint Catherine’s unmatched history of peaceful cooperation with its non-Christian neighbors, one finds a tolerance based not on enduring one’s neighbor, but on not judging him, directly traceable to Saint John’s anathema for condemnation of others. Almsgiving is also highly prized by the tradition, and the Sinai Monastery’s efforts to assist those in need are woven into the fabric of its earliest history. If anything goes even deeper than this toward explaining the unbroken bonds of mutual respect between monks and their Bedouin neighbors, it must derive from Saint John’s account of the fathers of a monastery near Alexandria whose spiritual estate he extols in the Ladder. Of all their virtues, the most admirable, he said, was the extreme care they exercised to never "injure a brother's conscience" in any way. To this day, a novice in Sinai quickly learns never to injure another’s peace, if he has any regard for his own. Perhaps no other practice is so evident in the daily interactions of the monks of the Sacred and Imperial Monastery of the God-Trodden Mountain of Sinai, as Saint Catherine’s is formally known. In an atmosphere so transparent that the very light seems three dimensional, whose granite crags remember the feel of God’s footsteps and the sound of His voice, anything but the impulsive good will implanted in the first humans betrays its synthetic nature. "By the visible nature of the place itself, Saint John was impelled and guided towards the invisible God," wrote his biographer. As reflected throughout John’s guide to the spiritual life, probably written between 580-650 when the monastic tradition in Sinai was already well established, the Sinaite ethos does not look for half-measures in condescension to the fallen reality of mankind. Neither however does it expect the impossible. Combining flexibility with truth, it simply upholds the ideal of perfection, so that those of us who are beginners may know where we stand, and thus, where we are headed. Obedience is never demanded in Sinai, because in order to be real, it must be freely offered, an expression of the free will bestowed by God on human nature. Obedience is voluntary in all Orthodox monasteries. But on the Holy Mountain where man met God in the Uncreated glory of the Holy Trinity, it must be the impulse of love for God alone. It is the heaviest form of obedience, requiring the maturity and focus of graduate school rather than college. 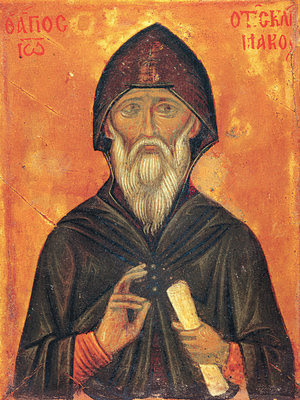 Thus John Klimakos warns new monks not to suffer shipwreck in the monastery harbor, having escaped sin on the open sea. It is one thing to bend one’s will because others are watching; another, because God alone is. Noting John’s frequent references to swimming and sailing the sea, it is hard not to find a desert dweller’s attraction to both, and if the hems of John’s robes were ever moistened while taking in a pilgrimage to Raithou on the Red Sea coast, he would not be the first to have inadvertently ventured a little too close to the waves. As John wrote the Ladder in response to a request from the abbot of the Raithou Monastery, it is not unlikely he had been there, considering the proximity, about 25 miles by foot, and given his own accounts of travel to more distant settlements. Saint John’s biographer takes note of his discernment in recommending that ascetics avoid vainglory by eating small amounts from all foods allowed to monks. These include fish, which would entail travel to Sinai’s coast. Modern times saw monks from the Holy Mountain still fishing their own seafood in Raithou, if no longer needing to fry their catch on the beach in order to transport it back to the Monastery through searing desert heat in edible condition. And, although early ascetics expired as martyrs on dry islands off the coast of Raithou when water shipments failed to reach them, the past century witnessed heirs of their zeal not afraid to undertake the three day trek from Saint Catherine’s to Raithou without benefit of food, water, or a map, oblivious to heat, hunger, and thirst by what can only be termed the action of divine grace. Whatever the nature of his own ascetic exploits, Saint John’s essential humanity reminds that monasticism consists of nothing more exotic than fulfilling the commandments of Christ – hopefully with fewer distractions, but in essentials much the same as the life in Christ outside its walls. Knowledge of God through purity of soul as taught by Saint John in the Ladder should not be considered the exclusive domain of monastics or theologians; on the holy ground of Sinai every Christian is called to be a theologian as a member of the royal priesthood, a vessel through which the grace of God shines onto all creation. “Every time the Divine Liturgy is celebrated, it is celebrated for all the world” says Father Arsenios, “It is a global event. An elder from Mount Athos has said that the Second Coming will take place when the Liturgy ceases to be offered up on earth…” Even when their numbers are few, Saint Catherine’s monks do not cease to liturgize every day of the week – not only in their great basilica at the foot of Mount Sinai, but in the surrounding desert chapels; on the Holy Summit where Moses received the Ten Commandments, and at the cave where Saint John Klimakos spent 40 years in ascetic solitude – never omitting to pray for the peace of a world in travail, and all those in it, that hope never cease. Displaying to all your inspired method. You led us up to the radiance of Theory. That He grant us His Great Mercy!